Still entrusting your dining choices to some online troll who eats nothing but hot wings, but sees fit to pass outlandish judgment on every restaurant in a five-mile radius? Unless you get your kicks gambling with your palate, please, let us throw you a rope. ChefsFeed, the insider’s connection to the best dishes and food culture as recommended by the world’s top chefs, shows you where the actual cooks point. Er, swipe. We’ll get straight to it: we’ve got a new, fresh-as-hell look. We've spent the last several months working closely with fellow chefs, restaurateurs, and all-around good eaters to better align the face we show to the world with who we really are—ferociously passionate, unapologetically bold creators. We’re pretty jazzed about it. If reviews and recommendations from the best chefs working today is child’s play for a food buff like you, there’s an endless stream of original content to splash around in. Get your blood pumping with the behind-the-scenes rush of a restaurant opening, hear chefs read their own scathing reviews, and plug into an editorial universe that pulls back the curtain. The New Look: You know that feeling when you get a slick new knife and you can’t stop drooling over it? It’s like that. Our new look is brighter, more visceral, and more intuitive. The New Website & App: Both platforms have improved functionality with streamlined, real time content. Feed Me: Geo-located feature plots the best dishes and venues within walking distance. The New Cities: Killer food is no longer limited to the heavy-hitting cities like New York or San Francisco. It’s broader than that —you just need to know where to look. We’ve expanded our coverage to hook you up with thousands of chefs in over 50 cities to help you jet past the surface fluff and find the mother lode. The New Content: How do you tap into the genuine voice of the chef community? You give it a place to speak, and then you listen, that’s how. Our new stable of content spans everything from grab-you-by-the-collar videos, to industry columnists, to stories on the stuff chefs actually think about when they’re knocking down tickets all night. For the Chef: Because you have 25 lbs. of chicken to prep or an entire line to scrub down, we’ve done you a solid and made it way easier to post whenever you want. Your shout-outs and recommendations will be posted in real-time, and can be now done directly from your home screen. That new kid who can’t even make mirepoix right could do it. And because we care about your karma, we’re rolling out Dish for a Dish, where we’ll match every dish you post with a donation to No Kid Hungry. Seriously. It’s that simple. 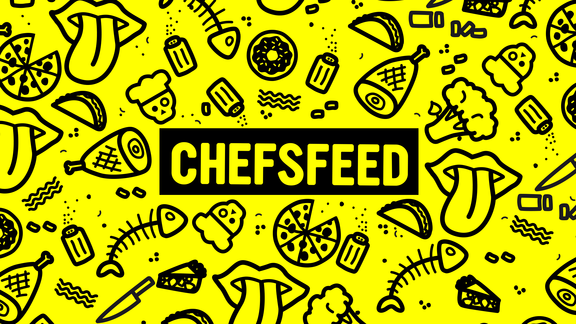 ChefsFeed gives chefs their voice back in the racket of clueless reviewers descending on kitchens everywhere, and churns out content that’s worthy of the true hustlers. Go ahead, eat with abandon—the industry’s got your back.